While discussing seborrheic dermatitis with a friend, she asked if I had looked at my diet as source for a cure. This is a common response these days . . . but I’ll admit I’m a skeptic that food can cure seborrheic dermatitis. I try to consume lots of veggies, fatty fish, yogurt/kefir (yay probiotics!) and good ol’ H2O. I think (hope?) these simple steps give my skin (and overall health of course) a nice boost. But personally, I’m not willing to make dramatic diet changes in order to save myself from face dandruff. Why? The same reason I won’t make dramatic diet changes to save myself from fatness. Twenty years of dieting (or even the more acceptable term “eating healthier”) have taught me that restriction leads to binges. (Read this great article full of reasons nots to diet.) So for me, no food is off limits. That said, I certainly understand that some people may really have very real food sensitivities that contribute to skin conditions. One commenter on our site said that pork flares up his skin problems! (A bummer to give up bacon, but worth it I think.) You can experiment on your own or find a good food sensitivity test practitioner. Eat in a way that feels wholesome and right for YOU. I combed the web to find a few of the most common nutrition cures for seborrheic dermatitis. Do your own research and talk to your doctor before diving in. Gluten free: Big surprise, right? But truly, dandruff CAN actually be a symptom of Celiac’s Disease. And there are anecdotal accounts of seborrheic dermatitis due to a gluten sensitivity. Paleo: Did cavemen have seborrheic dermatitis? Hmmm. This diet eschews grains, dairy and sugar. All sorts of health benefits have been touted by adherents to this popular way of eating, including a decrease in dandruff. Low-fat: Totally opposite of paleo! It is said that malassezia (the yeasty fungus that is destroying your skin/life) feeds on saturated fat. So some have found that reducing the fat in their diet, especially of the saturated variety, sends SD packing. Alkaline diet: This diet is all about reducing acidic foods, which some believe will aggravate dermatitis. Acidic foods include oats, barley, berries, peanuts, butter, olive oil, coffee, squash, corn . . . ok, the list goes on and on. You can also go to town with alkaline foods like alfalfa, broccoli and pumpkin to name a few. This just sounds complicated. Good luck being a dinner party guest. Yeast-reducing diet: SD is a result of malassezia yeast, so it’s a just connect-the-dots concept to reduce yeast in the diet. That means giving up baked goods, cheese, mushrooms, soy sauce and all booze. Reduce or eliminate sugar, which promotes yeast. So pretty much everything wonderful in life. Sigh. Supplements/nutrients: Ah, why not just pop a few supplements? I’m skeptical of vitamins but I did try biotin when I had the post-birth hair loss after my second baby. My hair grew back (thank to the biotin? who knows!) but I did not see a change in my skin. Other supplements touted as miracles for seborrheic dermatitis include folic acid, zinc, selenium, potassium, B12 and fish oil. Probiotics are also a common suggestion from the natural cure crowd. I’m not sure if it helps my skin, but I try to get a yogurt or kefir serving in most days to help my digestive and immune systems. 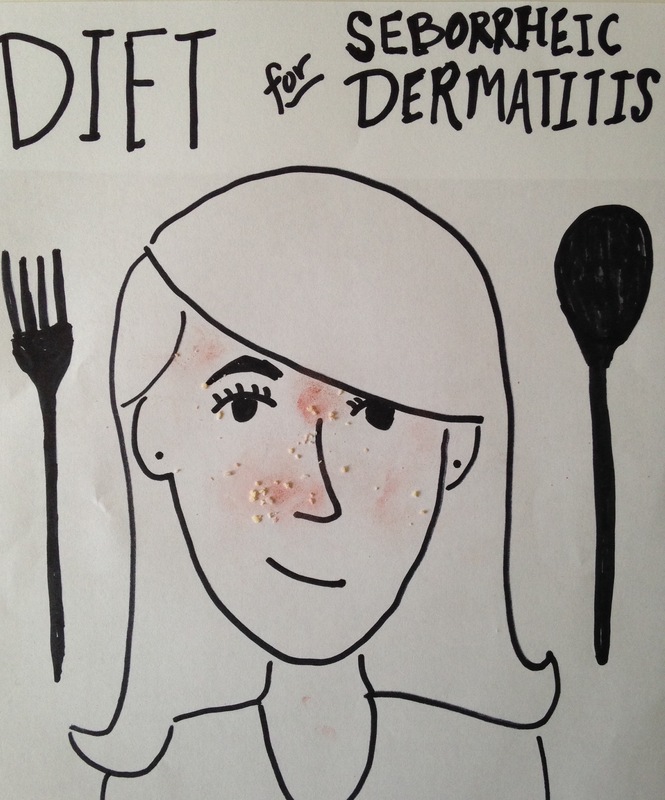 What diets or supplements have YOU tried to help your seborrheic dermatitis? Have you seen results? I am a lifelong seb-derm sufferer, and have TRIED IT ALL…from prescribed steroids to natural cures like honey masks. Hands down the most helpful thing has been avoiding dairy. I have recently started restricting carbs (including gluten) and sugar, and I am 90% sure I am seeing even more positive results. This, in addition to using Dead Sea salt water as a toner, has my face looking the best it has in years. Not “normal”, mind you, but allllmost. I believe seb derm triggers are different for everyone, so what works for one person doesn’t always work for another. Yes! Everyone is SO different! Glad you found something that works for you . . . even if it means passing on cheese and ice cream. I have not tried the Dead Sea salt water but I have heard about it several times. I will try soon. Thanks!